Near real-time ozone and sulfur dioxide data products from the OMPS instrument are now available through the Land, Atmosphere Near real-time Capability for EOS (LANCE) system. OMPS is one of five instruments aboard the joint NASA/NOAA Suomi National Polar-orbiting Partnership (Suomi-NPP) satellite, which was launched in October 2011. Suomi-NPP observes Earth’s surface twice every 24-hours (once in daylight and once at night) from a polar orbit 824 km (512 miles) above the planet. OMPS data help scientists monitor the status of Earth’s ozone layer and verify whether this vital atmospheric layer is recovering as expected. 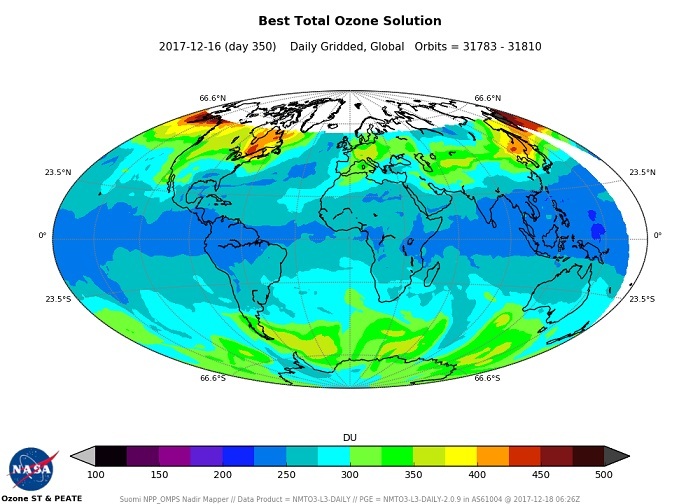 OMPS NRT products complement the ozone and sulfur dioxide NRT data already available through LANCE from the Ozone Monitoring Instrument (OMI), which is aboard NASA’s Aura satellite (launched 15 July 2004). In fact, since the OMPS ozone data retrieval algorithm is so similar to the OMI retrieval algorithm, OMPS ozone data represent a continuation of the OMI data collection and allow for the analysis of more than a decade of continuous ozone data. In addition, while OMI global coverage is limited to every two days, OMPS provides daily global coverage. Unlike standard data products, which have the extensive processing, quality assurance (QA) reviews, and validation necessary for use in scientific research, NRT products are available much sooner after a sensor overpass. While not intended for use in scientific research, OMPS NRT products are valuable tools for monitoring the health of the ozone layer, evaluating ultraviolet (UV) radiation intensity, and managing ongoing natural events such the transport of dust and smoke from dust storms and biomass burning. In addition, the OMPS NRT aerosol index and sulfur dioxide data provide critical information about the size, location, and movement of sulfur dioxide and ash clouds from volcanic eruptions, which pose hazards to people on the ground and to flying aircraft. OMPS Nadir Mapper Level 3 Daily Total Ozone for 16 December 2017. Purple and blue colors indicate low ozone concentrations; orange and yellow colors indicate higher ozone concentrations. Ozone concentrations are measured in Dobson Units (DU). Image by NASA’s NPP Ozone Science Team. Three hyperspectral instruments make up OMPS: two instruments looking down through the atmosphere and one instrument looking through the atmosphere at an angle. The downward-looking Nadir Mapper (NM) and Nadir Profiler (NP) instruments take daily measurements of the global distribution of the total atmospheric ozone column. The Limb Profiler instrument, on the other hand, looks through the atmosphere at an angle to measure the vertical distribution of ozone from roughly 15 to 60 km (about 9 to 37 miles) above Earth’s surface on a less frequent basis. Ozone (O3) is a minor component in Earth’s stratosphere (the atmospheric layer extending from about 10 to 50 km/6 to 31 miles above the surface), however it plays a critical role in absorbing incoming solar UV radiation. Without stratospheric ozone, Earth would be a hostile environment for humans and most other living organisms. Ozone at ground level, on the other hand, is considered a pollutant, and can damage vegetation and harm human health. Image of Southern Hemisphere ozone concentrations showing the peak extent of the ozone hole over Antarctica on 11 September 2017 (purple/blue area). Image credit: NASA/NASA Ozone Watch/Katy Mersmann. Levels of atmospheric ozone were severely impacted in the late-20th century from the use of chemicals that depleted atmospheric ozone, such as chlorofluorocarbons (CFCs). 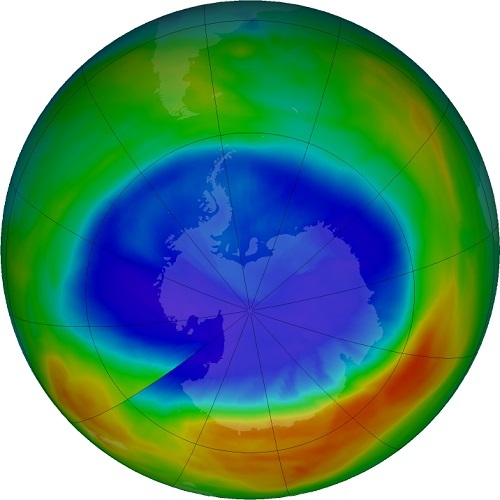 One result of the reduction in atmospheric ozone was the development of the Antarctic ozone hole, which led to significantly higher concentrations of UV radiation in Antarctica and the Southern Hemisphere. These ozone-depleting chemicals were phased out under the international Montreal Protocol on Substances that Deplete the Ozone Layer. The 2017 ozone hole over Antarctica reached its maximum extent of 7.6 million square miles (about two-and-a-half times the size of the United States) on September 11. This was the smallest ozone hole detected since 1988 and the second consecutive year with a smaller ozone hole. NASA scientists point out, however, that the smaller ozone hole extent in 2016 and 2017 is due to natural variability and not a signal of rapid healing. LANCE is part of NASA’s Earth Observing System Data and Information System (EOSDIS). EOSDIS provides end-to-end capabilities for managing NASA’s Earth science data, which are acquired from satellites, aircraft, field measurements, and numerous other EOSDIS programs. The primary services provided by EOSDIS are data archive, management, and distribution; information management; product generation; and user support services. The addition of OMPS NRT ozone and sulfur dioxide data products in LANCE provides another source of information for scientists, researchers, and managers monitoring the atmosphere, and a valuable continuation of NASA’s ongoing ozone data record. Mersmann, K. & Stein, T. (2017). “Warm Air Helped Make 2017 Ozone Hole Smallest Since 1988.” NASA news release, 2 November 2017.